Cruising clubs already existed in other parts of the world, usually founded in cities by like-minded ICC 1st Committee mtg enthusiasts at winter gatherings. But the new organisation had given itself a special flavour by arranging to bring about its establishment through a cruise-in-company by a small flotilla of five yachts on the southwest coast of Ireland. 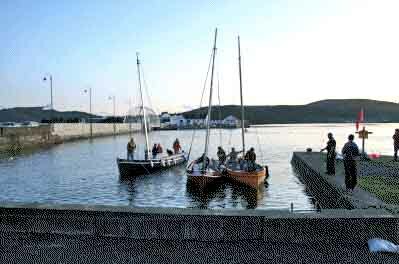 The inaugural meeting was held in Glengarriff at the head of Bantry Bay on the evening of Saturday July 13th 1929. The leading inspiration for the establishment of the club came from Harry Donegan of Cork, supported by Billy Mooney of Dublin. Both were sailing enthusiasts of broad interests. Donegan was a founder member of the Royal Ocean Racing Club, having taken third place in the inaugural Fastnet Race with his cutter Gull in 1925, while Mooney was to be a class winner in the same event with his ketch Aideen in 1947. Thus, offshore racing was seen by many of the early members as an integral part of their activities, and by the 1960s the ICC was organising Ireland's biennial Admiral's Cup teams. But international sailing was becoming an increasingly complex business, and it was apparent that the health of the club would be best served by concentrating solely on cruising and the services the club provided for its members and the cruising community. The objects of the Club shall be to associate sailing yachtsmen, to encourage cruising with particular emphasis on cruising off the Irish coast, to gather and publish information useful to yachtsmen concerning tides, tidal streams, harbours, anchorages, lights, navigational aids, shore facilities and such like, and to record and/or publish logs of cruises and passages undertaken by members. Ever since 1929, the Club's members have worked voluntarily towards the production of Sailing Directions which today cover the entire coast of Ireland in two volumes. Sailing Directions for the South & West Coasts of Ireland - which began life as the South and Southwest Coast book edited by Harry Donegan in 1930 – was published in its Eleventh Edition in 2006, while the Tenth Edition of the East & North Coast Directions – originally published as the East Coast book in 1930 under the editorship of Billy Mooney – was published in 2003. Since 1931, the Irish Cruising Club has organised log competitions, inaugurated by its premier award, the Faulkner Cup, donated by northern member James Faulkner. The publication of a privately circulated Annual collates the members' cruising narratives, and today the Annual has become a profusely-illustrated 150-page book, published in time for Christmas. Women members have always had equal rights in the club, and the first to win the Faulkner Cup was Elizabeth Crimmins in 1934. In 1939, the winner was Daphne French, for a remarkable cruise to the far end of the Baltic Sea in a little boat called Embla. So although the Irish Cruising Club - which has no premises of its own - is essentially based around a membership in Ireland cruising the Irish coast, its activities have always included a significant outward-looking element. The ICC now has many challenge trophies, and each year's award-winning cruises include major international and transoceanic ventures, including voyages into high latitudes. However, the club continues to be an amateur organisation without any professional administration, and in order to make this possible, membership is limited to 550, with applications being accepted each November for consideration at the Club's committee meeting in January. The Cruising Association of Ireland was set up with the aim of working with the Irish Sailing Association and the Royal Yachting Association [Northern Ireland], for the promotion and encouragement of cruising and of social union among its members. Click here for all the latest Cruising News. The association was set up as a virtual association using internet based technology. This is a faster and more cost effective medium to use for communication, and internet users are unashamedly the main target for CAI membership. The association has been established now for a number of years. In 2010 we are working towards a re-launch of this website at the end of the first quarter, and a new effort is being made in 2010 to establish cruising connections with the Yacht Clubs and Marina’s with a view to encouraging cruising Sailors to get out on the water. Sharing of Information on cruising : Articles on Cruising topics, ports and destinations around the coast. Social Interaction among members : Promotion of Yacht Club talks of interest to Cruising Sailors, encouraging members to get out and cruise regularly in company. Events on and off the water : While the CAI does not “run” events directly, we will work with Yacht Clubs and Marina’s to encourage events of interest to Cruising Sailors. Click here for details of upcoming CAI Events. Representation: We will endeavour to work with statutory and non statutory authorities in resolving issues that affect cruiser sailors. Shipping News & Views from the Irish and Celtic Seas since 1995. The Northwest Charter Skippers Organisation was inaugurated in January 2002, and was formed to enhance and develop Charter Boat Services through the interchange of Information, between our membership and through the promotion of a fleet of fully licensed, Insured, and well equipped Modern Sea Angling Vessels adopting best practice and providing a high quality service in Sea Angling and general tourism charters to the Northwest Coast of Ireland, our Slogan being Service with Safety. When you choose a member of the association you can be assured that the operator is fully licensed and insured and will have the experience and qualifications to provide the Service you require at prices you can afford. The association does not provide a booking service, we provide links to angling sites and information pages submitted by our members. The information listed is produced by the individual members of the organisation and the owners of the relevant web sites. Top class fishing aboard quality charter boats in North West Ireland. Enjoy the very best in Sea Angling Charters.